“We’d like to say a HUGE thank you to Chris, Katy and the whole team at Porth Beach for our recent stay with them. “We were so excited and grateful when we were told we’d won the competition prize of a week’s stay in one of Porth’s amazing caravans. “It got even better when we arrived and were upgraded to a decked caravan with views of the beach and sea. Perfect! “We love Porth! 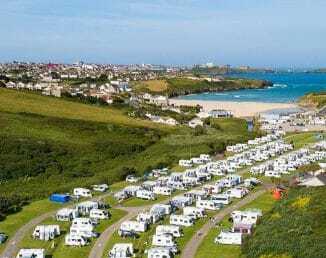 I used to holiday with my parents staying in a succession of campers, caravans and tents in the touring area. We came back every year for the perfect location of beaches on the doorstep, a brilliant pub just across the road and most importantly scrupulously clean shower block. “I returned years later when I started courting but this time staying in the caravans on site and enjoying the luxury of warmth in October and March. I got engaged on Trevelgue Headland, spent my honeymoon at Porth beach and am now enjoying introducing my daughters to the delights of this wonderful place. “You couldn’t find a more welcoming, better placed or friendlier campsite and we just can’t wait to watch our daughters grow up to love it as we do. Now that you’ve read April’s thoughts, why not try our holiday park for yourself? With a range of accommodation available at great prices, and a beautiful setting close to the beach, book your stay with us online today!